The Ivory Foundation contributes to the development of family vegetable gardens, grown ecologically and using the principles of permaculture and agroecology. In Roosboom, near Ladysmith in KwaZulu Natal (South Africa), the “One House, One Garden”, project, supported by Designing Hope consists of duplicating a model garden for the most disadvantaged families of the township. 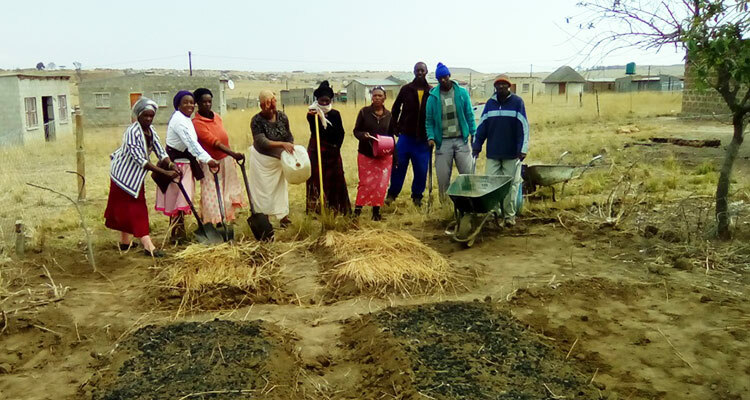 Every month, team from the Silethithemba Center, a house for orphans managed by Designing Hope, visit a family to set up a fenced garden and a vegetable garden to provide a substantial supplement for food. Families are chosen according to the emergency of their situation. Family members are all trained in the creation of permanent raised-beds, rainwater harvesting, the creation of compost with household waste, and the principles of permaculture and agroecology. Basic equipment and reproducible seeds are also given to each family supported by this project. The members of the family are also invited to attend Silethithemba Center to learn how to adopt a balanced diet, and to prepare recipes using vegetables and traditional foods.